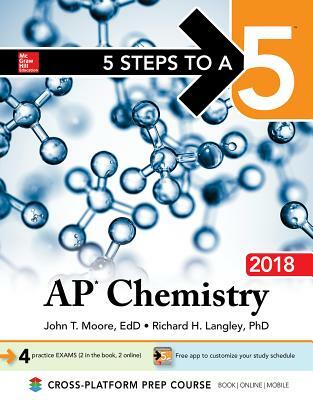 5 Steps to a 5: AP Chemistry introduces an easy to follow, effective 5-step study plan to help you build the skills, knowledge, and test-taking confidence you need to achieve a high score on the exam. This wildly popular test prep guide matches the latest course syllabus and the latest exam. You'll get online help, four full-length practice tests (two in the book and two online), detailed answers to each question, study tips, information on how the exam is scores, and much more. Because this guide is accessible in print and digital formats, you can study online, via your mobile device, straight from the book, or any combination of the three. John T. Moore, Ed.D., teaches chemistry at Stephen F. Austin State University in Austin, TX. Richard Langley, Ph.D., also teaches chemistry at Stephen F. Austin State university and is a grader for the AP Chemistry exam."